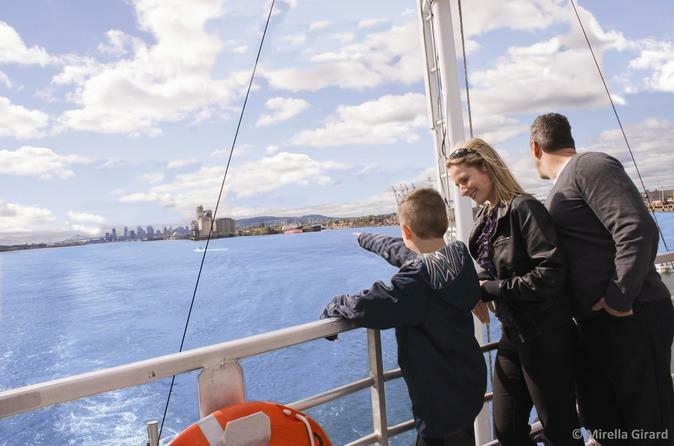 Welcome aboard for an urban cruise with a difference! Meet a historical character as you cruise aboard the AML Cavalier Maxim, hearing fascinating anecdotes. Enjoy a fresh look at history and geography as you follow in the wake of a legendary explorer and discover the charms of Montreal. Explore 22 miles (35 km) of the historic St Lawrence River including the Jacques-Cartier Bridge, the shoreline and the islands of Boucherville. Aboard your boat, the AML Cavalier Maxim, take advantage of the sunny terraces and relax while admiring the city, or enjoy the panoramic views from the glassed-in dining room. You'll see the city from a completely new angle. The snack bar on board offers food and drinks including sandwiches, salads, cookies, muffins and juice to enjoy on one of the sunny decks. Or you can liven up the party with a refreshing Captain's cocktail! All food and drink purchases are at your own expense.